New DPAC Badge for sale! This is the new “must have” accessory in 2017 for the properly turned out street activist. 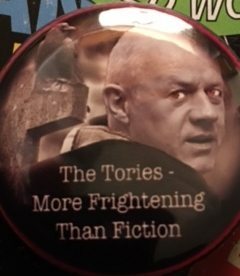 Tastefully designed in shades of lurid green, it features Damian Green in a scene from “The Omen” with the caption “The Tories, more frightening that fiction”. It costs a quid plus 78p postage. The quid will go to DPAC campaign funds and the 78p will go towards buying the newly privatised Royal Mail bosses a new private plane probably, but we can’t do anything about that.